This guide will cover how to add an Appointlet link to your LeadFuze sequences. 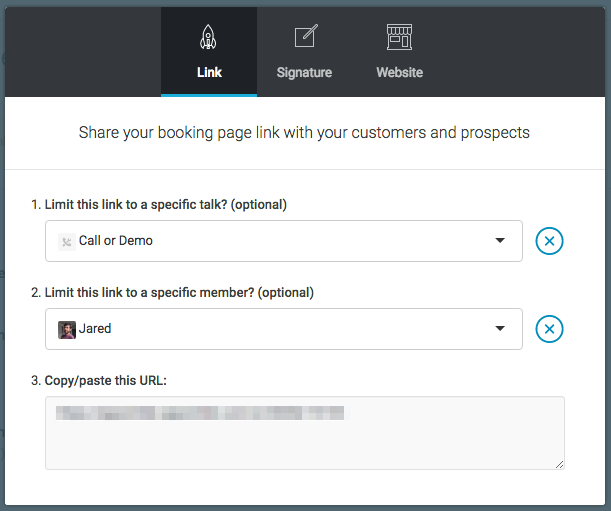 By the end, your LeadFuze sequences will have a link to your booking page that will not only let prospects book a time with you, but also will pre-populate their information (Name, Email, Company, etc) so that they don’t need to type them in again when booking. The first step is to create the appropriate form fields in Appointlet to capture the prospect data from LeadFuze. Currently LeadFuze supports First Name, Last Name, URL, Company, Email, Title, and Phone, so we’ll need to create a form field in Appointlet for each of those. When creating these fields, make sure that none of them are marked as “Required”, just in case you don’t have one of the values in your LeadFuze prospect database. Next you’ll need to get your booking page URL, which you can find in the “Share” dialog box. If you’d like to link to a specific Meeting Type or Member, you can customize that information here. Once you’re done, copy the generated URL. Now we could easily just paste your booking page URL into one of your email sequence templates, but then when your prospect clicks the link, they’ll be asked to re-enter all of the information you already know about them. Let’s save them from that hassle and make sure we maximize our conversion rate. And now your booking page link is ready for action!